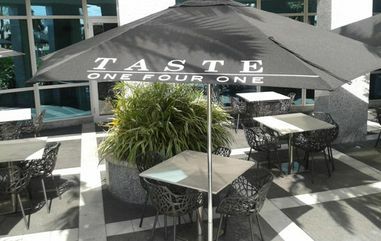 Taste One Four One sets the standard for dining excellence. Located within Seon Place, Bermuda's first 10-storey development, we're the Island's newest tapas bar and restaurant bistro. Serving breakfast, lunch, dinner, coffee and drinks, we're the perfect destination for both business and pleasure. Daily specials like fresh local seafood, soups, salads, burgers and sandwiches have been perfected by Chef Abdul Amjath, Chef Stephen DeSousa and Chef Karthigayan Tangaraj. Our atmosphere is as warm and welcoming as our friendly staff. Great for groups, Taste One Four One accepts both reservations and walk ins. Indoor and al fresco seating are available – which ever you prefer! Running late? You can get take out in no time. We also offer catering for corporate and private functions.